When most people think of Mickey Mouse, Donald Duck and Goofy, they tend to think of Disney’s classic animated shorts, starting with Steamboat Willie and continuing today with Disney Channel’s Mickey Mouse Cartoons, or children’s shows like House of Mouse or Mickey Mouse Clubhouse. What a lot of people don’t know or don’t remember is that Disney has published some amazing comic books starring their characters, and they’re the types of comics that would surprisingly fit right in with Marvel Comics’ current output. Now that’s not to say that Mickey should join the Avengers, or Uncle Scrooge should develop his own Iron Man armor. But in much the same way Marvel is publishing a Star Wars line, a Disney Adventures type line of comics would be amazing, and would fit right in. Disney’s long history with adventure comics goes back decades. In 1933, Floyd Gottfredson was writing and drawing the Mickey Mouse newspaper comic strip. Knowing Mickey’s reputation and modern newspaper comics, it would be easy to assume that this was a three or four panel gag strip. It was far from it. Gottfredson was sending Mickey on globe trotting adventures, and having him solve mysteries in his hometown of Mouseton. Although these strips showed troubling racist imagery that was common in the day, overall the stories themselves were great. One story worth pointing out is the infamous introduction of Micky’s greatest archnemesis- the Phantom Blot. The Blot was a simple design- a shrouded black silhouette- but he was a criminal genius. He stormed through Mouseton in an amazing crime spree, and it was up to Mickey to stop him. One thing I remember about these stories- they were filled with peril. This above panels was only one of many deathtraps that Mickey found himself in. 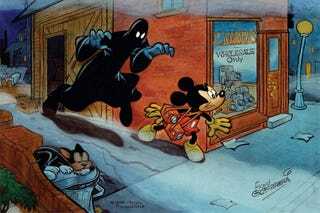 Mickey was able to stop him- the story was called Mickey Mouse Outwits the Phantom Blot after all- but it was an incredibly fun story. Another famous Disney comic series was the adventures of Scrooge McDuck in Uncle $crooge (yes, spelled with the dollar sign). Many children of the 80's will remember fondly the Disney Afternoons series DuckTales, but fewer know that those cartoons were largely based on the Uncle $crooge comic books. Uncle $crooge was about the life and times of Scrooge McDuck, the richest duck in the world. Although there were many short funny stories found in the series, the series is most famous for the adventure stories set in both Scrooge’s history and in the modern day. Many of these stories were by comics master Carl Barks, who defined the many qualities and history of Scrooge. When Scrooge wasn’t getting into humorous misadventures around Duckburg though, he was travelling the world with his nephew Donald and Donald’s nephews Huey, Dewey and Louie, seeking out lost treasures a la Indiana Jones (a future Marvel Comic for another day). He also found himself defending his vast fortune from the Beagle Boys and Magica DeSpell. Beyond these famous examples, Disney has numerous other adventure stories in its back catalog primed for revival, from Donald Duck Adventures, to Disney Afternoon staples Chip & Dale Rescue Rangers and TaleSpin, to later cult entries like Darkwing Duck and Gargoyles. Currently, the long running Walt Disney Comics and Stories and Uncle $crooge, are being published by IDW, but the popularity of the Disney properties in the United States has declined drastically. IDW is fantastic, but they’re not Marvel. Marvel Comics, owned by Disney, is publishing stories based on other Disney properties on top of their own superheroes- such as Star Wars, Figment, Big Thunder Railroad, and the upcoming Haunted Mansion. The precedent is there. In comparison, DC Comics has had ongoing series based on Warner Brothers properties Scooby Doo and Looney Tunes/Bugs Bunny for decades. Although neither series has ever sold in high numbers, they sell consistently every month. Marvel could buck that trend. With top talent in their pool, relaunching a fresh take on these classic characters seems like an instant hit for Marvel. They know how to tell stories about plucky, crime-solving, unlikely heroes and globe trotting multi-millionaires, because they have been for years. It definitely seems like a win-win, with Marvel publishing valuable Disney intellectual properties, while those IP’s regain their popularity. But until then we have the classic comics still out there!